I don't know about you, but I have been soooooo busy with assessments and report cards. At the end of the trimester, I feel a little over whelmed by all the assessments. I try to keep with my regular schedule, even when I am doing assessments. If I can, I give assessments in a small group. Most of our Kindergarten assessments have to be done one on one. I still have my kids go to their literacy centers but I do not pull my reading groups. Instead, I pull kids one at a time to do the assessment. Well, I have to admit, I was pretty, darn, HAPPY over my DRA scores. My little honeys are becoming fabulous little readers. 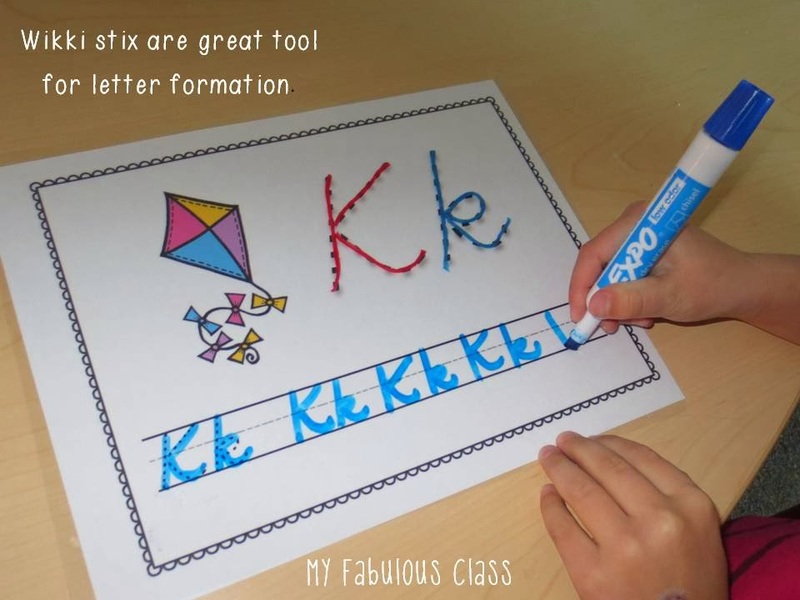 Another assessments we do is letter formation. That was a different story. I have a couple of kids that have BEA-utiful handwriting. They look like second graders. Most of the kids are average, with a few funky letters...like Q. What is it about Q that is so tricky??? I also have few pumpkins who can write the letters in their name....sort of. I'm starting to panic, a little. Okay, A LOT! We only have 1 trimester left and their handwriting is NOT 1st grade ready. I wanted to come up with a fun, hands on way to practice letters ANS work on developing fine motor skills. This set is great for wikki-stix. Have you used wikki sticks before? You can mold them into ANYTHING! The kids love them. They stick to the sheet and then you can take them off and restick them to another sheet. You can buy wikki sticks anywhere. Here's a link to some on Amazon. Wal-mart has generic version by Cra-Z-Art that works just as well. Students can practice rubbing their finger over the letter to help with formation and then practice writing their letters underneath it. The second picture shows using pompoms. They have to use the tong to move the pom pom which is great for fine motor. I had told a co-worker that I wanted plastic tweezer but I could not remember where I had seen them. The next day she comes with these tongs. She had found four for a dollar at the dollar tree. I used regular size pom poms because that is what I had, but I think small ones would probably work better. What little pumpkin doesn't love play dough? Again, this is a great way to develop fine motor skills. All of that squeezing is great for developing those little muscles! 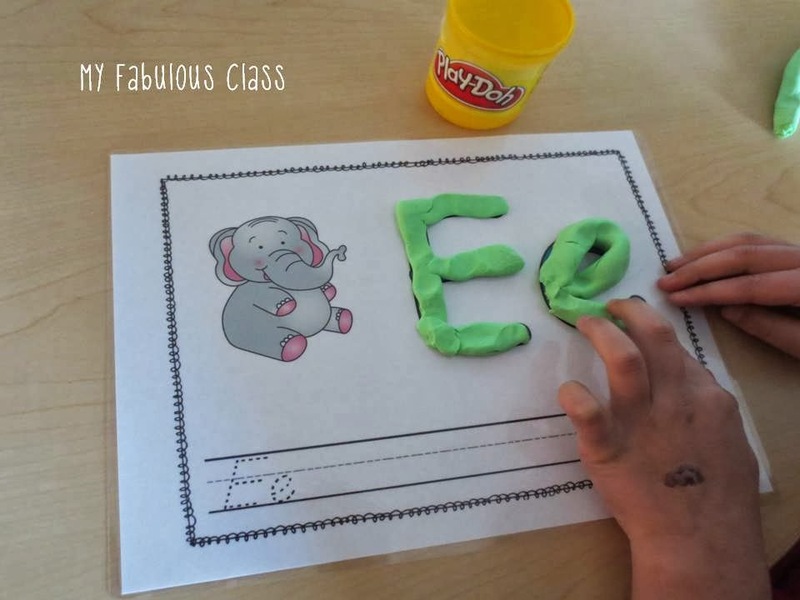 Again, students can trace over the letters and then write them with a dry erase marker. The third set is a half page and it shows letter formation. This picture is one of the black and white versions (it also comes in color). I had the kids color this one and then write the letter with glitter glue. Once it dries, they have a nice raised surface for letter formation. 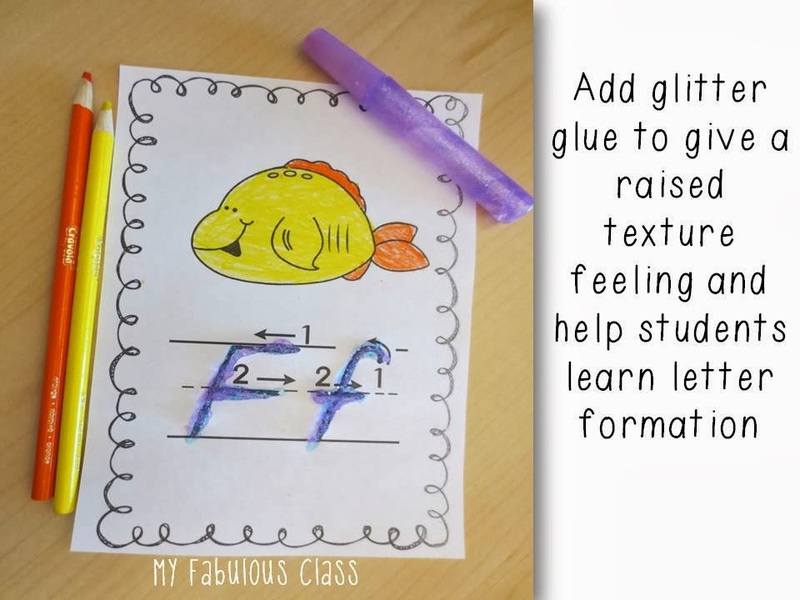 The glitter glue came in a multi-pack at dollar tree. It is the perfect size for little hands. 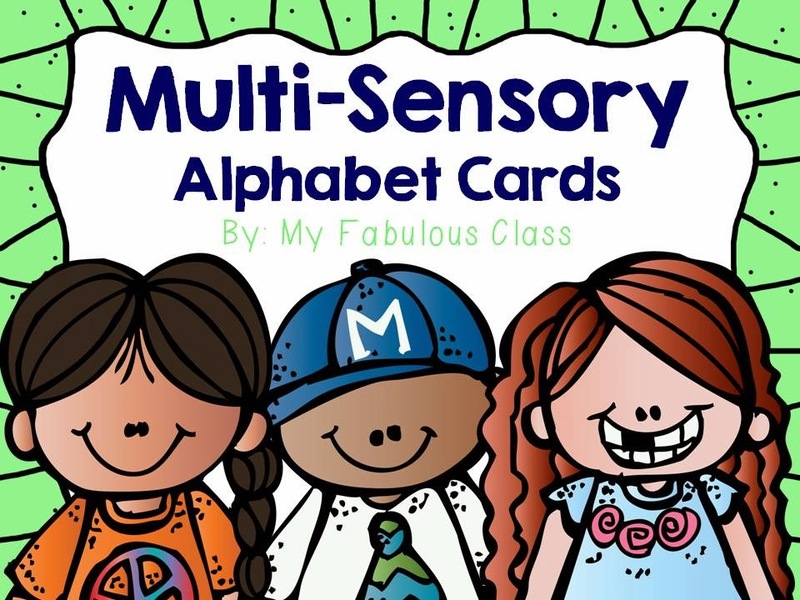 Another use for these cards is to trace the letters in sand. Guess what? I forgot to take a picture. Okay, the sand didn't last long because it got spilled in about three minutes. I AM going to spend more time talking about the sand tomorrow and let them use it again. I will take pictures and update this page.